required to maintain current client relationships - in one solution. Provide your sales team with a single view of your customers, streamlining their process from call to close. 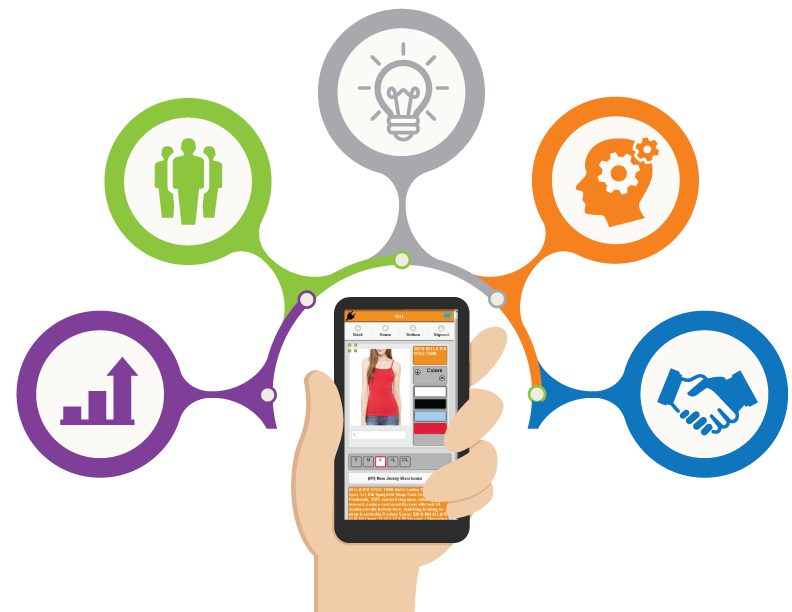 Create and execute targeted sales campaigns using information synched from across your business. Track leads to maximize your sale efficiency by targeting leads that meet your criteria, and are more likely to purchase. Maximize the time your sales team spends selling with productivity and collaboration tools accessible anywhere. Your sales team is the heart that pumps revenue throughout your company – but it can’t work alone. Sales isn’t just about the sales department anymore. That’s why your business needs a enterprise software solution that connects your CRM to your other departments, and other systems including ERP and WMS. From lead to loyal – FDM4’s customer Relationship Management software finds selling opportunities throughout your business process. Delivering a fast user interface, our CRM crosses industries, increasing your team’s productivity, and streamlining the sales process – resulting in happy, loyal clientele. Could you benefit from more revenue and new customers? Every company works to grow their client base to increase revenue, but it is never as simple as it sounds. Let FDM4 help you. Our CRM solution provides your sales team with the tools they need at the touch of their fingers – meaning that in the office, or on the road they’re connected and capable. Whether you already know where you need help, or if you are looking for an assessment of your business, learn how FDM4 can support you with our enterprise CRM solution. Win More Business with FDM4’s CRM. Customer Relationship Management is more important to businesses than ever before. 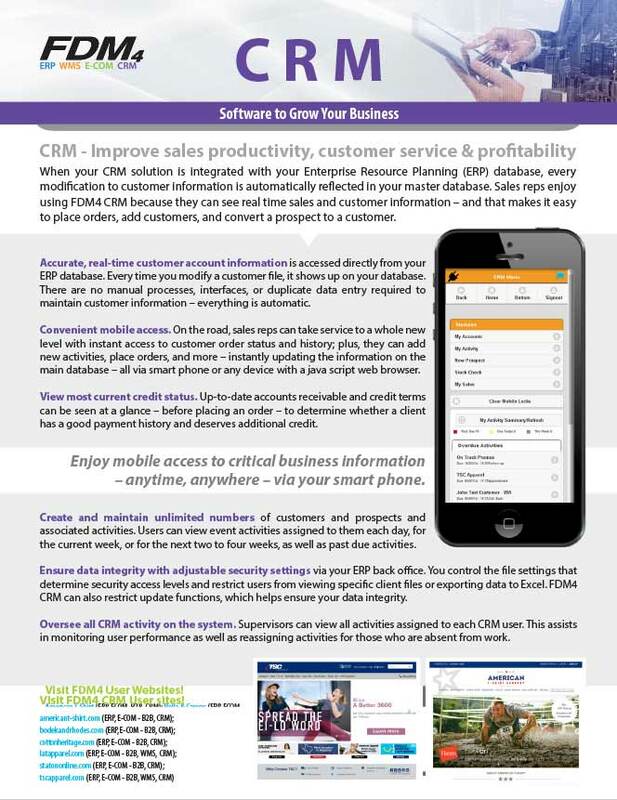 This is why we’ve built a CRM software solution to help you stay ahead of the curve. Manage your client lifecycle with the CRM tools your team needs to improve their efficiencies, such as; contact management & assignment, adjustable security settings, integration, and most importantly mobility. Learn more about what FDM4’s Enterprise CRM has to offer below. What’s Included in FDM4’s Customer Relationship Management Solution? 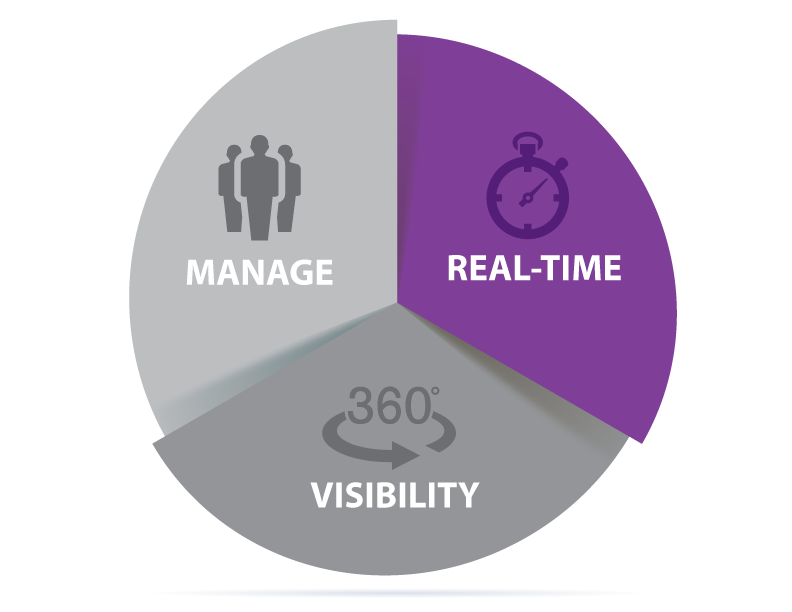 Providing end-to-end visibility of your business, and a 360% view of your client. 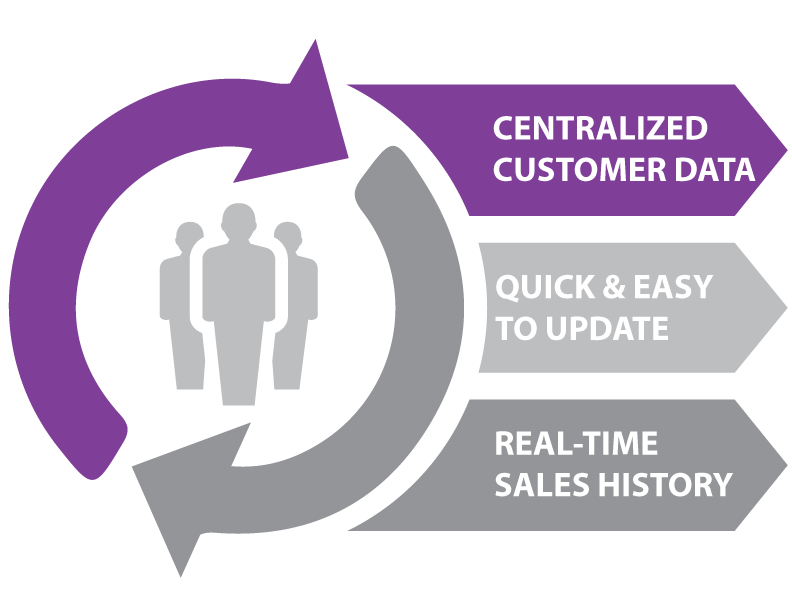 Centralize customer data. With FDM4’s Customer Relationship Management software your sales team will be able to access customer and prospective data all in one location. Quick and easy to update – maintain comments contact information, and so much more, all in the same file. Working with an existing client? With FDM4’s Saleforce software you’ll have access to real-time sales history – no need for uploads, or downloads. Everything from payment & credit statuses, to shipment & tracking information are available at the touch of a finger. 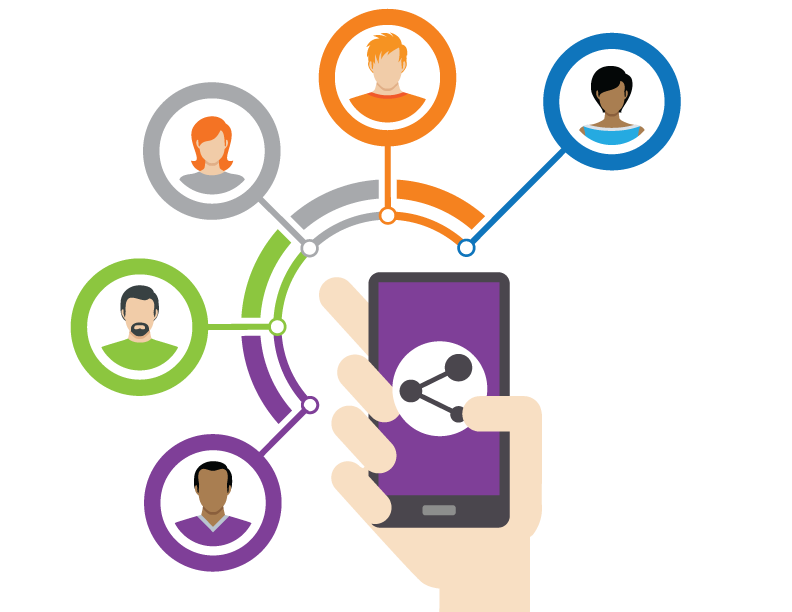 Centralize your customer data with a CRM that allows your sales team to focus on the important thing – Your Clients. Find the direction you need to focus your sales towards the most profitable, winnable deals, while optimizing cross and up selling opportunities. Users of FDM4’s CRM Solution can view their activity list by date, days past due, and a custom date range. Ensure your team never misses an assigned lead again. Outlook integration sends your team email notifications and allows them to initiate an appointment from Outlook or within the CRM. Included with FDM4’s CRM software is the ability to attach documents, in any form, to a customer activity either by direct assignment or via email. This ensures that every appointment is met, and every record is kept. The CRM Software Solution Built with a Modern Sales Team in Mind. 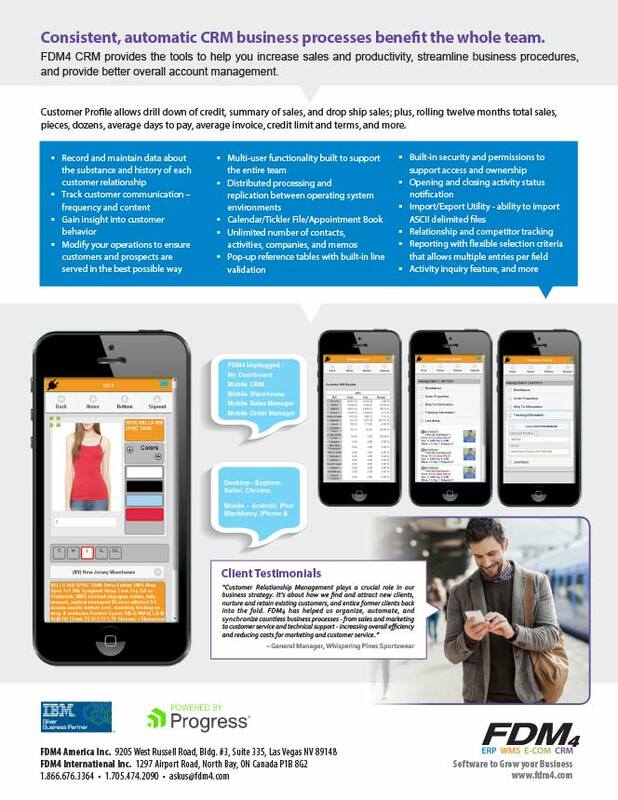 Designed with the look and feel of a mobile app, FDM4’s mobile CRM is smartphone compatible.Giving your sales team access to client information at the touch of a finger, we ensure ease of use is always in mind – improving your sales times, and efficiencies. 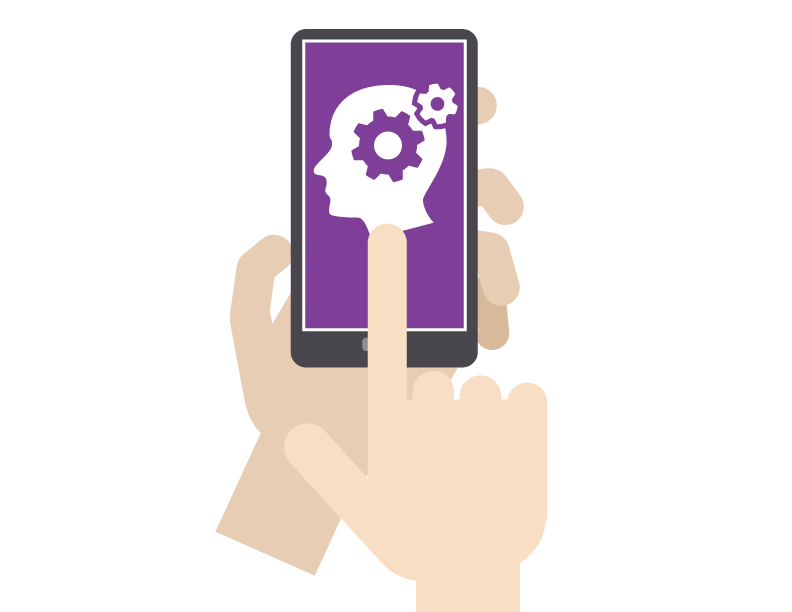 Quickly and easily create orders via a style-based matrix on your mobile phone using our Salesforce software. 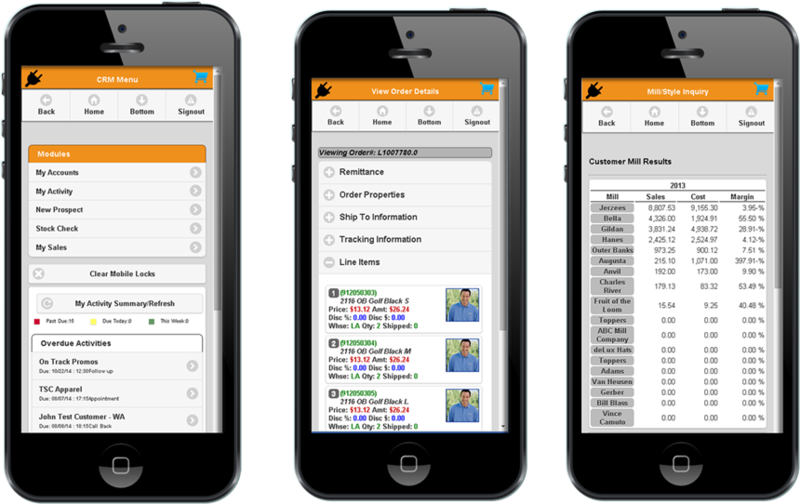 All mobile CRM orders are simultaneously created in your ERP software, and can be automatically dropped to the warehouse – either by your sales team or by the client – providing an ease of use never seen before. Schedule your sales team, and manage their actions every step of the way. Managing your team has never been easier – and we don’t say that lightly. With FDM4’s Customer Relationship Software you can now schedule activities for users based on criteria you define. This means that instead of a sticky-note your team will be sent a reminder to call a client automatically.  Want to gain visibility into sales, but don’t have the time or desire to micro-manage? Oversee all CRM activity – monitor user performance and reassign activities of users who are absent or overwhelmed. Real-time reporting means that you’ll always be up-to-date about the what’s going on, without having to take a walk around the office. With FDM4’s CRM solution you’ll be able to seewhere a client is in their life-cycle, and appropriately assign staff. 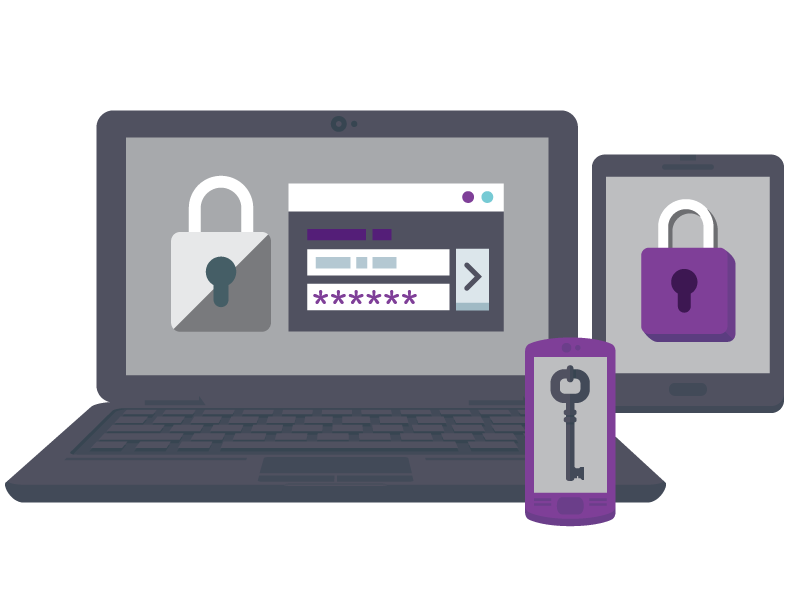 From install to update – you gain control of your system with adjustable security settings. Keeping your database sorted and secure is an important feature of any CRM solution. Control the integrity of your information with a CRM solution that ensures that input or imported data never creates duplication. Our contact management software conducts a phone number, city, state, and zip match before creating customer files in the ERP. Customization allows your business to decide what data appears in your e-files . With user definable data fields FDM4’s CRM allows you to build customized labels and fields that can be added to your master file. Ensure every clients file is complete and ready to be used by your sales team.